I don't quite get the rear wheel removal at the :15 and :50 marks. Did consumers not believe that the front wheels of car could also be the drive wheels? Had every American forgotten about the groundbreaking (and beautiful) 1934-57 Citroën Traction Avant? Well, probably, but among others, the VW Golf/Rabbit, all SAABs and the bottom-feeder Dodge Omni/Plymouth Horizon twins had all been in the market for at least a couple of years prior to GM's "X-body" 1980 introduction. 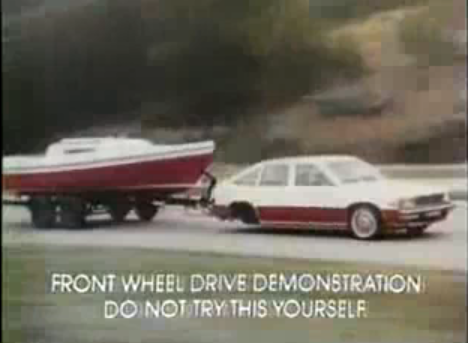 I still can't believe that a tandem-axle boat trailer could have negative tongue weight. Or that GM would recycle the name from one of the all-time marketing failures, a name that has a double meaning. Who wants to get a citation while driving anyway? Maybe they're trying to convince you that in the likely case of a wheel falling off, you'll still be able to tow your deep sea fishing trawler to the coast. I know it's something I look at when purchasing a new car. Rear wheels falling off - probably to be expected with the level of "craftsmanship" and "engineering" that GM baked into each of their cars during that era.